We provide a thorough scan of the home including walls, ceilings, and floors. 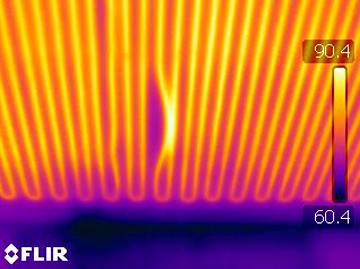 The infrared camera shows thermal variations which provide us with crucial information that could range from energy loss and electrical problems to water damage, roof and pipe leaks, presence of fungi, damage from pest and rodent infestation, and potential structural defects. For a complete building envelope inspection to be performed a minimum of 18 F temperature differential is required inside / outside. Our infrared services are a great compliment to your home inspection because of the ability for the thermal imaging camera to see deficiencies that are not visible to the naked eye.